The old saying “necessity is the mother of invention” rings true for the founders of Care Giver Support Products, LLC. (CGSP) — a company that manufactures a portable, foldaway shower that accommodates a wheelchair. As Larry Arnold, the company’s inventor and Vice President of Development, said, “No one should be denied the comfort of a warm shower.” But, before the FAWSsit™ Fold Away Wheelchair Shower came along, it was obvious to the five founders of the company that there were plenty of people being denied this comfort. The idea for the company began at a neighborhood café when Larry’s wife, Rosemary, mentioned her husband’s latest “invention” to Judy Seidmeyer and Patricia Johnson. 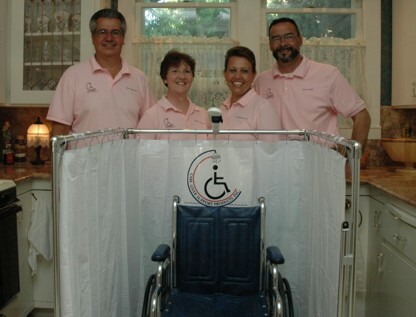 Rosemary must have been talking to the right people because it didn’t take long for Judy, a Registered Pharmacist, and Pat, a Registered Nurse, to recognize the fact that Larry’s portable shower invention would fill a pressing need for people with disabilities. Pat has also spent her career in the health-care industry as nurse, educator, author and family caregiver. In her 39 years of nursing experience, Pat was very much aware of the need for a convenient, simple bathing device for the medical community. Pat, now the Vice President of Marketing for CGSP, knows the challenges of providing quality home care. She recalled the story of a family member in a wheelchair who found the only way he had of showering was to go out into the yard and use the garden hose. Rounding out the company founders is Steve Seidmeyer, the Vice President of Sales. After retiring from careers in the wholesale pharmaceutical and the telecommunications businesses, Steve suffered a heart attack and learned first hand how important a shower was to improve circulation and promote healing. Using his expertise in sales and marketing, Steve now works to ensure that as many people as possible benefit from the FAWSsit™ portable shower. He gets much satisfaction from working for CGSP. “It’s about people helping other people to make a difference in someone’s life,” Steve said. Thousands of people on a daily basis are denied the simple pleasure of a warm shower because they don’t have access to a shower that accommodates a wheelchair. Proudly built in America, the FAWSsit™ portable shower is a foldaway wheelchair shower stall that can be set up and used anywhere there is access to warm water and an electrical outlet. It is fully self-contained with shower head, drain pan and pump to remove waste water. The FAWSsit™ portable shower weighs less than 40 pounds and is 48 by 35 by 8 inches when folded for storage and 48 by 35 by 36 inches when unfolded. For further product details, refer to the CGSP Web site at: www.cgsp.net/. For additional stories, read: "Bariatric Bathing Solutions" and "Accessible Bathing While Traveling." Copyright 2005 - 2009 AccessTravelCenter.com. All rights reserved.